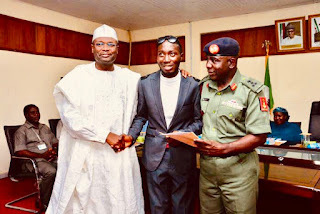 The Independent National Electoral Commission(INEC) has announced the automatic employment of one Mr. Mr Daniel Oluwatobi, an Ex-NYSC Corps member who lost his sight while in serving. A statement by the commission via its twitter handle stated that the INEC Chair, Prof. Yakubu presented a Letter of Appointment to ex-NYSC member after loosing his sight while on official duty as INEC ad-hoc staff in Yobe state during the 2011 general election. The statement added that the letter of employment issued at the at the NYSC Headquarters, Abuja in June 2016 was witnessed by Brig Gen Sule Kazaure, the DG. INEC Chair, Prof. Yakubu (L) presents a Letter of Appointment to ex-NYSC member, Mr Daniel Oluwatobi, who lost his sight while serving as INEC ad-hoc staff in Yobe during the 2011 general elections, at NYSC HQ, Abuja in June 2016. Brig Gen Sule Kazaure, the DG was there https://t.co/U6Fj2N84wH ".